Rahul Dravid, who has been recuperating from a finger injury that he picked up in the Adelaide Test against Australia, was also seen at both the morning and evening nets. "My finger injury has healed and I am feeling fine now," he said. Dravid has not played any competitive cricket since the Australian tour - he didn't turn out for Karnataka in the recent Ranji one-dayers - but has had intensive practice with the bowling machine for the last few days. The tests today - held under the supervision of Paul Chapman, the physical conditioning coach, and Paul Close, the physiotherapist - included skinfolds, bleep tests, repeat sprint and aerobic strength tests. While Laxman, Singh and Jaffer left for the airport to catch their respective flights, Kumble, the local boy, bowled for 30 minutes at the NCA ground. He started off with some spot bowling before using his full regular run-up. 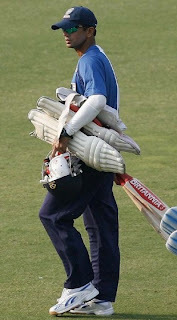 As he left the ground, Dravid came in for his evening nets session.